Know the latest and what’s happening at My Little University. Check out our school year calendar. Visit My Little University and get to know our faculty. We look forward to showing you around. 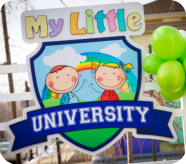 Do you have referrals for My Little University? Tell other parents about our programs and services.